American oil giant Chevron want to build a destructive pipeline across unceded indigenous territory to carry fracked gas to the coast, and export climate change to the world. We say NO. We do not need fracked gas, we do not want another pipeline and we will not stand by as colonial governments and greedy corporations push us over the climate catastrophe cliff edge. Chevron is the new corporate face of the Pacific Trail Pipeline project, having recently become 50/50 partners with Apache to build a fracking gas pipeline across 500 kilometres of largely unceded land, from Summit Lake to LNG plants planned for Kitimat. On March 30th we will greet them with resistance across BC and around the world. As politicians put economic growth and industry interests ahead of carbon common sense and indigenous rights, it is up to us take direct action to raise the cost of pushing ahead with the project, and raise the stakes in the PR battle. We encourage autonomous creative direct action against Chevron and any others involved in the development and financing of Pacific Trail Pipeline. Occupy offices, drop banners, demonstrate in city centres, lock-on at the pumps, subvert the Chevron brand, hand out leaflets… the choice is yours! Everywhere they operate, Chevron exploits land and people for money, often through the use of force, and without taking responsibility for the consequences. Battles against environmental racism and illegal oil wars, movements for indigenous sovereignty and migrant justice – we amplify our resistance by uniting our struggles, so we are calling for solidarity actions and events against Chevron across Canada and around the world. The Pacific Trail pipeline can still be stopped. There is a huge groundswell of public opinion against BC’s carbon corridor, the Unis’tot’en are mounting a determined resistance against incursions onto their territory, and a space is being carved out where we can change the course of BC’s energy future. We know that dismantling the fossil fuel empire is a colossal task, but every action we take takes its toll. Chevron, this is just the start… your time has come, your days are numbered! Frontline indigenous communities have already said a loud and clear NO to the Pacific Trail Pipeline and have repeatedly affirmed that free, prior, and informed consent must be respected by both colonial governments and corporations. No consent has been given. Far from it – industry surveyors have been evicted by the Unis’tot’en and other clans of the Wet’suwet’en Nation, equipment seized and roadblocks set up against all further pipeline activity. On March 30th, let us help amplify their voices and help return decision making power to the people whose lives will be most affected by the pipeline project. 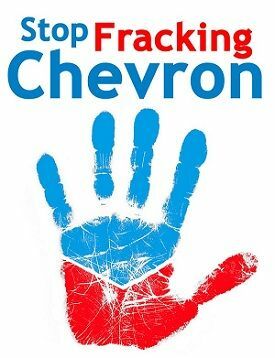 Chevron has an atrocious history of oil spills, gas explosions, toxic dumping, deforestation, water pollution, activist shootings, tax evasion and climate change denial. From the US to Nigeria, Australia to Angola, Brazil to Bangladesh, Chevron brings death and destruction. In Ecuador, after 8 years in court, Chevron was ordered to pay $8.6 billion in damages for 20 year of toxic dumping – but three years later, Chevron still refuses to pay. In Richmond, California, Chevron’s pollution is causing cancer and respiratory illnesses. In the Niger Delta, activists resisting Chevron’s unjust and unsafe production methods have been shot dead by local authorities (using Chevron helicopters). And the National Petroleum Agency of Brazil has actually banned Chevron from the country for its failure to take responsibility for the Rio De Janeiro oil spill. We are joining the global fight to put a stop to Chevron’s environmental and social crimes. Northwest BC’s shale gas fields are shaping up to be a major front line in the global battle against unconventional energy via the carbon intense environmental nightmare that is fracked gas. Fracking causes methane leaks, ground water contamination, hydrogen sulphide leakage, earthquake risks, not to mention the CO2 release when the gas is finally burnt. This exploitation of ever more difficult, expensive and harmful fossil fuel sources demonstrates the true greed, and insanity, of the present global economic system. We have a really simple message – we need to keep fossil fuels in the ground.